A few short weeks ago we had our most important cookbook club meeting in months. In an attempt at ultimate productivity, we decided to host a lunch featuring none other than Parties That Cook’s Spring Menus. The finalized list of recipes for all Spring cooking parties, corporate team building events, and classes hadn’t yet been released (Top Secret!). I must admit, I felt a bit special. This season, you can expect to see a lot of familiar recipes. Call them what you will — classics, favorites, “mine” — we love these recipes, and we’re sure you will, too. Let’s dive right in, shall we? 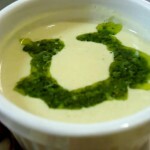 Creamy Artichoke Soup with Basil Pistou – Crissy elected to make this dish after a few days of indecision, and we were not disappointed! The soup had a delightful flavor, and was not heavy enough to overpower our appetites. Refrigerated, the soup lasted for a few days beyond this lunch! 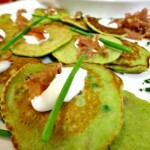 Sweet Pea Galetes with Prosciutto and Sour Cream – Christina signed on to make this dish. Having tried a few of the other galete varieties we’ve had on our menus over the years, I had high expectations. One bite was all it took to know we had another winner on our hands. Whole peas add a nice texture and a little surprise in the galetes, and you really can’t go wrong with a prosciutto and sour cream combo! 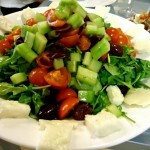 Greek Salad with Grilled Halloumi Cheese, Kalamata Olives and Smoked Olive Oil Dressing – Rebecca swooped on the opportunity to try this recipe. (“You had me at ‘halloumi’.“) What could have been another plain salad turned out to be a delicious dish worthy of center-plate. 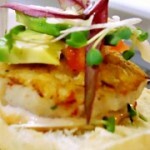 The ingredients really come together to provide the perfect balance of salty, sweet, and tangy flavors. Word to the wise: Do make sure you use a ridged grill pan when grilling halloumi. You really want those beautiful grill marks! Crispy Pancetta Wrapped Marble Potatoes with Caperberry Remoulade – Kelle called dibs on this recipe rather early in the game. Unfortunately, she came down with the worst cold the office has seen in a while, and was unable to bring anything in this cookbook club. 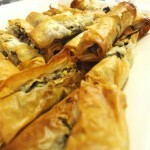 Spinach and Feta Cigars with Tzatziki Sauce – Bibby immediately staked her claim on these fun little “cigars”. To the best of my knowledge, she stuck to the recipe. A couple of ladies at the table expressed an initial concern about this dish, but all were silenced with the first deliciously crunchy bite. I, for one, am intrigued to learn just how many dipping sauces (and which sauces) would pair well with the cigars. 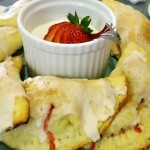 Strawberry and Rhubarb Empanadas – Rosie, the over-achiever, brought in these monstrous desserts for her second dish. They weren’t actually that big, but after eating so many other dishes, I knew I could/should/would not attempt an entire empanada on my own. These were so delicious! 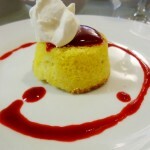 The crust was not too thick, and as a whole, the dessert was not overly sweet. Ya gotta try these! Overall, the lunch was great! I walked back to my desk feeling satisfied, if not a bit too full, and excited for all the positive feedback we can only imagine trickling in this season. Get ready for some awesome recipe blogs to come! Have you ever wanted to be one of the “cool kids”? It’s OK to admit, we can’t all have been Cheerios at McKinley. There’s still time to make the transition, even for those no longer in school. The IT thing to try right now: Vegetarian Food. Parties That Cook is here to help with this recipe for delicious Polenta Toasts with Red Bell Pepper Pesto and Goat Cheese that will give you a whole new view of vegetarian food! 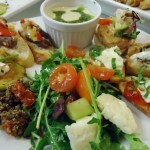 This recipe can also be found in our Appetizer Recipe Library! Polenta: Lightly oil a rimmed baking sheet. Combine milk, salt and butter in a large heavy saucepan. Bring to a boil. Gradually add the polenta, whisking until smooth. Reduce heat to low. Cook the polenta until it is creamy and thick, stirring frequently, about 5 minutes. Pour out onto oiled sheet, spread evenly so that it is very smooth and flat. Let cool to room temperature. Red Bell Pepper Pesto: Roast the pepper over a stovetop flame until blackened (or broil in the oven until blackened). Transfer to a paper bag for 5 minutes to steam then peel off the charred skin and remove seeds and stem. In a food processor, blend the peppers, chipotle, almonds, garlic, oil, lemon juice and zest, Parmesan and salt until very smooth. 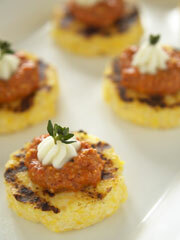 Grilled Polenta: Using a wet, 2 inch round cookie cutter, cut out polenta circles. Heat canola oil in a large non-stick grill pan or griddle. Cook polenta on one side until golden then flip and cook on the other side. Transfer finished circles to a serving platter. To Serve: Mix the goat cheese, milk and thyme with a fork. Spoon goat cheese into a pastry bag fitted with a star tip. Put a dollop of the pesto onto each polenta circle. Pipe a rosette of goat cheese in the center. Garnish with thyme sprig and serve. Want to try something new, eat delicious food, and learn a few new cooking techniques in the process? 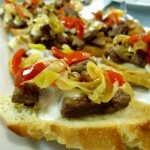 Then be sure to check out our first ever Vegetarian Tapas Cooking Class on March 1, 2011! Vegetarian International Tapas (similar to the one above) are on the evening’s menu, though you don’t actually have to be a vegetarian to attend. After this class, you may just be inspired to try Source, a Vegetarian and Vegan restaurant with a much-anticipated opening in San Francisco on March 2.